Svitzer Australia might complete more than 50,000 tug jobs in Australian ports every year, but the company is also a key player in maritime emergency response, as a fire at Port Kembla in June 2018 demonstrated. 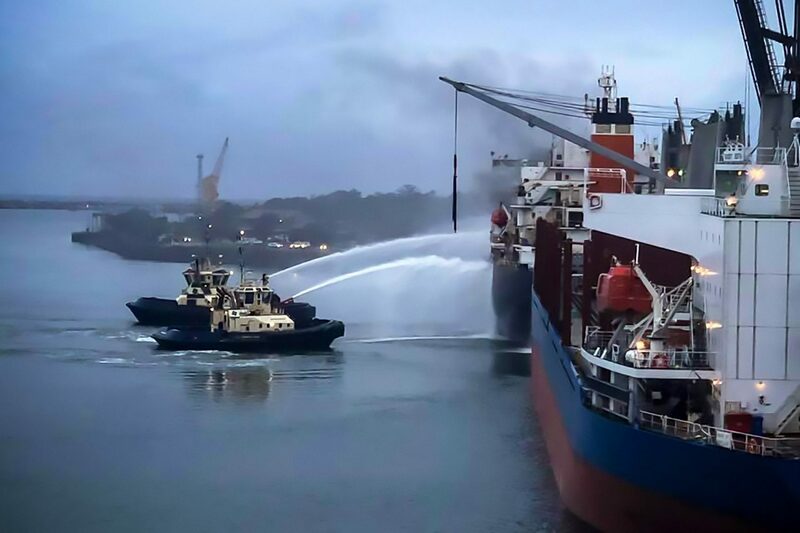 At 3.37 am on 18 June, the Svitzer operations centre at Newcastle was alerted by the Harbour Master to a fire on the bulk carrier, MV Iron Chieftain, which was docked beside the BlueScope steel works. Barunga’s Tug Master said that by 3.45 am, the A-class tug was fired-up in the Svitzer tug-pen and its Fire Monitor System primed. “It took us ten minutes to reach Iron Chieftain, which was giving off thick smoke as we approached,” he said. While standing-off about 30 metres from the burning ship, a message from the port’s Vessel Traffic Centre was received to communicate via the NSW Fire and Rescue’s VHF system and deal directly with the Fire Chief on the wharf. Boundary cooling is an attempt to keep the steel hull cooled as it heats-up from a fire, allowing temperatures to remain at safe level. The boundary cooling was provided by the tugs’ “FiFi” equipment – an external fire fighting system which features an additional pump that draws water from the harbour and pushes it through a deck-mounted water-cannon at an approximate rate of 600 cubic metres per hour. The water was trained on the port (seaward) side of Iron Chieftain, just in front of the ship’s accommodation block. “Each month we drill using our FiFi system as per our safety management systems, and several times a year we also perform drills with our local fire brigade. Only a month ago we participated in an exercise with NSW Fire and Rescue, Port Authority and a number of other local stakeholders,” a member of the crew said. Svitzer provided two tugs as an initial response, with an additional tug on standby. On Tuesday at noon, Svitzer was asked to provide continuous boundary cooling with one tug, and by early Wednesday morning, the Harbour Master requested that two tugs continue boundary cooling. The response lasted five days as NSW Fire and Rescue continued to extinguish the blaze on Iron Chieftain. Amazingly, the three Svitzer tugs at Port Kembla managed to continue all shipping operations, ensuring no further impact to the port. Svitzer Port Kembla operations runs three tug boats – Kiama, Marloo and Barunga – two of which are Z-Techs and one ASD, as well as three lines boats with more than 50 employees. Iron Chieftain is a self-discharging vessel with unloading equipment inside the holds. The system uses two conveyor belts that push together to lift the cargo out of the hold, and it was the conveyor cargo system which caught fire. “The emergency was complicated because the fire had spread through the access tunnels under the holds. It made the hull very hot which kept the firefighters from entering initially,” said a Tug Engineer. “The fire system on the tugs uses a large centrifugal pump powered by its own Caterpillar engine. It moves so much water that we can be called on by Fire and Rescue to connect to their hoses to tug manifolds,” he said. The emergency response function is important for the harbour and the Svitzer tugs and crews are always prepared for events such as the Iron Chieftain fire. The fire was finally declared to be out on June 24, after seven days; it was a success but unfortunately Iron Chieftain sustained a lot of damage and is believed to be retired from service. By the time the emergency was declared over, three Svitzer tug boats and numerous crew had rotationally provided boundary cooling, standby duties and met operational requirements for the entire period. Svitzer’s emergency response work includes assisting vessels that have lost power, propulsion, steerage, or are incapable of operating under their own power in all types of weather and conditions. This work can be dangerous at times, which is why the crews are prepared, constantly trained and aided with technology in order to respond.